Join us March 16 for Kathleen Baldwin sharing the tips and tricks for getting emotion “write”. Bestselling Fiction is all about Emotion. Give your readers a good cry. Sock them in their emotional gut! Elicit a satisfied sigh. Readers crave vicarious emotional experience. Explore emotional devices and techniques used by bestselling authors, techniques that will aid you in setting up your scenes to mimic true to life emotional experiences. Kathleen Baldwin will open her Writing Toolbox and illustrate the use of several effective emotional devices, in particular the one she calls The Emotional Code. This is a game-changing tool, one you don’t want to miss. Kat will draw examples from authors you know and love. Award-Winning Amazon-Bestselling author, Kathleen Baldwin, will use vivid examples from successful authors to illustrate several powerful techniques. Come prepared to participate in hands on exercises as you learn how to catapult your writing from good to unforgettable! Kathleen Baldwin loves adventure in books AND in real life. She taught rock climbing in the Rockies, survival camped in the desert, was stalked by a mountain lion, lost an argument with a rattlesnake, spent way too long in college, fell in love a dozen times and finally married her very own hero. They’ve raised four free-spirited children. She’s written several Amazon bestselling, award-winning Traditional Regency Romances. Her alternate history for teens, A SCHOOL FOR UNUSUAL GIRLS, was a Junior Library Guild selection. 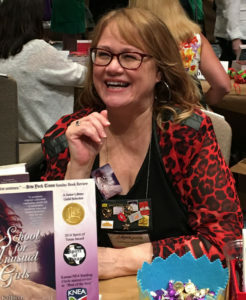 New York Times Sunday Review called it “enticing from the first sentence.” Texas library Association awarded Kathleen the 2016 Spirit of Texas for middle school reading programs. Kansas State NEA Reading Circle gave her a starred review in their “Best of the Best” for High Schools. REFUGE FOR MASTERMINDS won a 2018 Booksellers’ Best award. Scholastic licensed her series for school book fairs. Ian Bryce, producer of Spiderman, Transformers, Saving Private Ryan, and other blockbuster films, optioned her series for film.